If Teruel's thirteenth- and fourteenth-century inhabitants witnessed the rise of Mudéjar style (added to Unesco's World Heritage List in 1986), those at the dawn of the twentieth century saw how buildings created using a brand-new architectural language found their place in the city. These two events, while distant in time, both conceal a specific social argument. As in other cities, Modernisme in Teruel can be linked to the local bourgeoisie, who aimed to compete with buildings erected by the aristocracy in bygone centuries as a power symbol. To bring such desires to life, they championed Pau Monguió i Segura, from Tarragona, who they saw as the ideal architect to create their buildings. The third party in the process were the artisans of Teruel, who contributed with great professionalism to these works. This was a happy complicity which infused a singular, striking energy into Teruel's Modernista architecture. While the city did not experience sufficient demographic increase to allow the addition of an Eixample or extension as in Barcelona's case, yet a building renewal did occur in the Old Town. It is in the area of civil architecture where Modernisme flourishes with the greatest vigour. A new breed of construction, the apartment building, based on better interior distribution, greater hygiene and more ostentation in its visible aspects, meant that three basic elements were foregrounded - the entrance, hallway and staircases - which, along with the façade, became for the architects the object of designs suited to the contemporary, "modern" taste. Teruel boasted architects such as José María Manuel Cortina - who designed the beautiful Ermita del Carmen - Ramón Lucini, Gregorio Pérez Arribas and Pere Caselles. 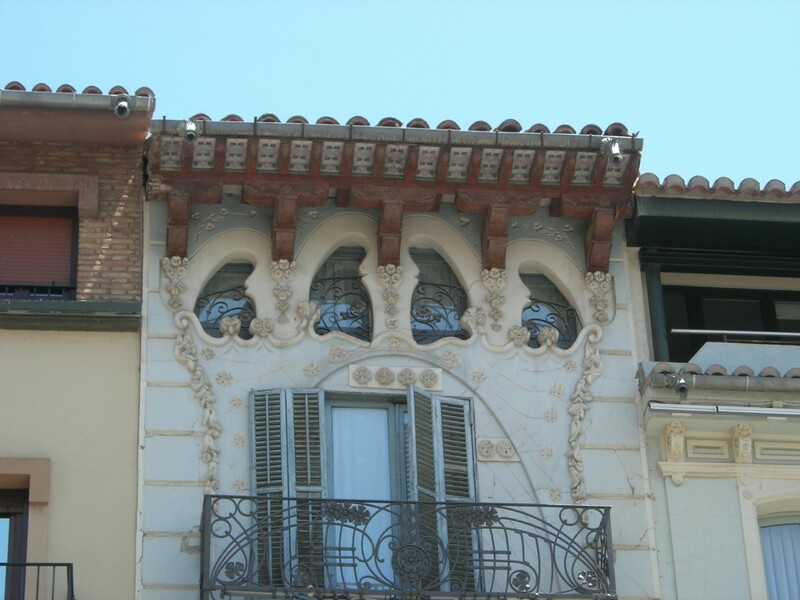 The latter was responsible for a large portion of Reus's Modernisme. He was Monguió's predecessor as Teruel's municipal architect after having been his classmate at the Barcelona School of Architecture. It is difficult to ascertain, in some cases, whose works were which. Yet Monguió was the main reason behind his extended stay in the city from 1897 to 1923, interrupted from 1902 to 1908 when he moved to Tortosa. Monguió expresses himself, depending on the building, in the languages of Art Nouveau, the Glasgow School and the Viennese Secession, yet always underscored by the direct influence which the architect Lluis Domènech had over him. The clearest example in this aspect is "El Torico", a house which, on analysis, shares artistic proximity with the building Domènech created in 1905 for the Lleó Morera family in Barcelona's Passeig de Gràcia. In the same square as "El Torico", he left his mark on the narrow façade of "La Madrileña", a vertically orientated ellipse encompassing all three floors which acquires exceptional symbolic value in conjunction with his treatment of the balcony ironwork and the sinuous spaces under the eaves. Yet "Casa Ferrán" is his most ambitious, interesting work. To look at "Casa Ferrán", we drawn to its dynamism and the freedom which, in its windowed balconies and on the building's corner, acquire their maximum exponent. Motifs based on the force of nature, animal and plant symbolism - butterflies, stalks, leaves and flowers of different kinds - and on gentle curves, often a coup de fouet or whiplash, are dominant in "Casa Bayo" and "Casa Escriche". 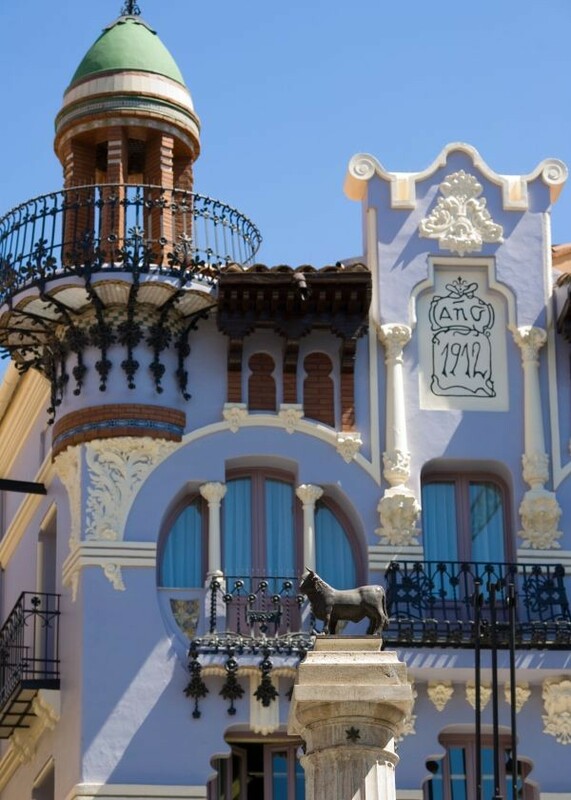 The work which the Teruel ironworker Matías Abad created for all these houses is admirable. It raises the craft of iron-working to a true art. Late examples such as the "Natalio Ferrán" house in the calle de San Francisco, designed by Monguió around 1914, already denote a decline in Modernisme, starting to blend in eclectic or rationalist attitudes. The latter were already present in the "Imprenta Perruca" designed by Francisco Azorín in 1912. Without a doubt, visitors to Teruel will enjoy the Mudéjar architecture, yet in their ramblings through its streets, who could not likewise feel attracted and ensnared by the Modernista treasures this delightful city holds?